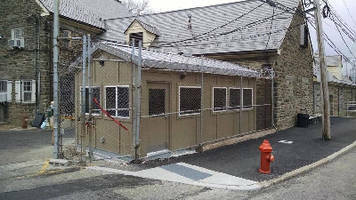 The Zoo had a need to replace their Public Safety office where they run their security department and screen employees and contractors for entrance to the facility. Their existing building was in a state of disrepair and it was time for a change. Anchor Modular Buildings worked closely with the Zoo’s facilities and security departments to design a new prefabricated office that would meet the architectural and aesthetic requirements of the surrounding buildings but also allow the installation of electronic locks, video cameras, secure access and more. Like many other Philadelphia landmarks and institutions, the Philadelphia Zoo is an American first. The charter establishing the Zoological Society of Philadelphia was approved and signed on March 21, 1859. In its first year of operation, the Philadelphia Zoo had 813 animals and received well over 228,000 visitors. Today, the Zoo has more than 1,300 rare and endangered animals, and its attendance is approximately 1.35 million visitors a year.